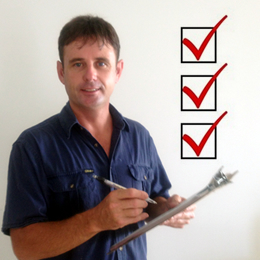 The purpose of this checklist is to help you get the best results from your Sewerage Treatment plant. Check for any cleaning agent that is labelled "anti bacterial" and do not use it anywhere where it will wind up in your sewerage treatment plant. 98% of all bacteria on Earth are beneficial for humans. Unnecessary use of anti-bacterial cleaning agents kill off this 98% in search of the remaining 2% of harmful bacteria. By all means use these cleaning agents where necessary, however, do so in a separate container and after use throw them out direct to ground rather than pouring them down the laundry tub etc. (This includes toilet cleaning products that are labelled "anti-bacterial" and also products that contain Eucalyptus and Tea Tree oils. Reduce the amount of detergent used, often by as much as 30%. Excess detergent seriously affects the clarity and sanitation process. Try to spread the clothes washing over the entire week rather than "dump road" on any single day of the week. Some products labeled "Bio Degradable" are arguably ambitious in their claims. The safest option is to keep the amount of detergent used down to a minimum. From time to time we will let you know how your system is performing. Flush 1 450gm box of BI-CARB SODA (or 1 cup of hydrated lime, pre dissolved in a bucket of hot water) down any toilet routinely each fortnight and at any time you notice your plant smelling. This neutralizes acidity and will remedy odour problems within 24 hours. Add 1 tablespoon of disinfectant (household bleach) down each basin, floorwaste and shower should you notice an odour in the bathrooms. Such odours are not coming from the Biocycle. They are caused by bacteria building up in the horizontal waste pipes from the bath, basin & shower where they discharge above the water seal in the floor waste. Never flush anything down the drain that will not break down. This includes nappies, condoms, tampons and sanitary napkins. Any of these can block in a pump impellor and cause motor burnout and other complications. There will arise ocasions when your unit requires attention other than the scheduled quarterly maintenance. This may be when some problem occurs with either the water pump or the air blower as indicated by the warning lights being activated along with the warning sound where the audible alarm is switched on. As soon as such a problem occurs, switch off the buzzer and please call us.